Americans paying attention to the building momentum from enemy forces – nations, groups, or persons levying war against the United States and/or conspiring to undermine America’s founding principles and overthrow the government – see danger ahead. But Americans are having a difficult time making sense of all that is happening and knowing what to do about it. As the Islamic counter-state intensifies its efforts in the U.S. without any legal action from federal or state security agencies, they are gaining deeper control of power bases and significantly increasing their propaganda efforts to align themselves with numerous cultural (civil rights), social (transgender, women’s), and radical (BDS, BLM, Antifa) movements inside America. The U.S. Muslim Brotherhood, primarily through their leading element the U.S. Council of Muslim Organizations (USCMO), is preparing the battlefield to support the work of the broader Islamic Movement which will establish the Caliphate centered in Turkey in the near future. Domestically, leaders of terrorist groups like Hamas doing business as the Council on American Islamic Relations (CAIR) work with elected officials to advance their stated objective of overthrowing the U.S. Constitutional Republic and establishing an Islamic State under sharia. The hammer for the Islamic counter-state is the Marxist counter-state. The Marxists are moving at an increasing speed openly calling for the infringement/destruction of Americans’ inalienable rights including: the right to life; the right to keep and bear arms; the right to free speech; and much more. Of course the Marxists themselves are self-declared arbiters of what “social justice” is and how it should be imposed. For instance, firm evidence reveals leaders of the U.S. Marxist counter-state meet with terrorist leaders overseas – e.g. Antifa and Islamic State/Al Qaeda meetings in Germany. The Marxist counter-state is a pure Marxist effort which truly intends to see Marxism rule in America. While the Marxist counter-state finds massive support in the leadership of the Democrat party nationally – see Trevor Loudon’s list of the 50 most obvious Marxists (communists/socialists) in the U.S. House of Representatives and 100% are Democrats – it is the establishment Republicans who create the environment in which the Marxists operate and, ultimately, will allow them to win the war. Republicans were elected because Constitutionally-minded Americans expect them to vigorously defend America’s founding ideals (Declaration of Independence), the Constitution, and the law. When elected Republicans fail to do this out of fear of being called names by the Marxist machine, they literally surrender those things – founding principles, Constitution, law – to the prevailing Marxist narratives, whether the Republicans intend to do this or not. These are quotes from the Marxist playbook, and objectively are meant to silence open discussion and a free exchange of ideas. By deciding to be popular and non-confrontational, Republicans like Mitt Romney, Marco Rubio, Paul Ryan, Susan Collins, Mitch McConnell, Lindsey Graham, and many others become the very mechanism by which the Marxists will succeed. When members of the U.S. Congress call Marxist candidates or elected officials like called Beto O’Rourke or Alexandria Ocasio-Cortez “good people” whose “policies are not aligned with ours,” they completely surrender to the prevailing narrative instead of speaking truth that these people profess an ideology which is dangerous to liberty and the future of the Republic. Killing babies, destroying the free market system, working to overthrow a sitting President, and all the rest that comes with a Marxist candidate like O’Rourke or now Congresswoman Ocasio-Cortez are not “policy” debates. These are things worth going to war over. Where is the compromise between liberty and tyranny? Where is the compromise between and Constitutional Republic and a Marxist State or Islamic Caliphate? Where is the compromise between a human’s inalienable rights to life, liberty, and property, and having them stripped from him/her? There is no room for compromise here. The only answer to this is to speak the truth boldly in love about the price of liberty and the absolute necessity to support it, defend it, and grow it. The only answer is to use the full force of the law and the government to dismantle the Marxist counter-state inside the United States and remove its leadership. The same must be done with the Islamic counter-state. Those who fail to do so, no matter what letter follows their name (R or D), are, whether they intend to or not, providing the very pathway to defeat for the United States and enabling the Marxist counter-state to grow unimpeded inside America. Our Democrat/Republican ‘leaders’ can point to these World ‘religious’ leaders as examples in the pursuit of ‘peace and tolerance’. After they have killed and/or enslaved us, Of Course There Will Be Peace! Awesome sir. It REALLY ticks me off that the US Government is not addressing this very real and severe threat to our freedoms. God Bless you and we WILL continue to spread your message. 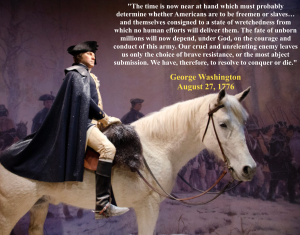 George Washington, America’s 1st popularly elected president — there were 8 others before him under the Articles of Confederation (the country’s original Constitution) — also saw “danger ahead”, which in 1776 impelled him to assert “we have, therefore, to resolve to either conquer or die”. Amen! Furthermore, since “truth” is simply the state of not being hidden — thus the opposite of truth is “concealment”, its important to avoid any attempt to customize said virtue, which would invariably result in ambiguity, not “love”. Take for example the burgeoning attempt by the contextually sociopathic sadists posing as governors of New York and Virginia, who seek to have their respective legislatures enact laws to allow other barbaric misfits to wantonly MURDER precious infants under the guise of necessitous medicine. Title 18 of the U.S. Code says NO loud & clear to any of that; God forbid, lets keep it that way. And as if said re-emergence of a nursery room strain of “Murder Incorporated” wasn’t enough, we learn by virtue of UTTs intelligence skills today that there now exists in the public domain an unequivocal list comprising the names of 50 Democrat U.S. House members, including the Speaker, who are not only Marxists of either the socialist or communist persuasion but thus, by default, presumably associate with the like-minded U.S anarchist Marxists who’ve been meeting intermittently in Germany with sharia adherent terrorist leaders seeking our destruction in connection with Islam’s advancing global war* on Western Civilization. *Anyone who wishes, therefore, to acquaint themselves in detail with a personal verbatim Arabic-to-English translated copy of Islam’s declaration of war on the United States, the original of which was seized by special agents of the FBI in abeyance to a federal search warrant from a subterranean basement in Annandale, Virginia in 2004, may do so by simply contacting http://www.securefreedom.org, and requesting (for a nominal handling & postage fee): GOVERNMENT EXHIBIT 003-0085 3:04-CR-240-G U.S. v. HLF, et al. Why are people in government positions especially Democrats falling asleep on these heinous issues? It has to be the Evil represented by fallen angel Satan pulling the veil over humans eyes over the truth about God. The only stand is one against it. And now I’m on a list! For what? I vote for America’s founding principles. Everyone wants to condemn us, but everyone still wants to move here. The leaders of the DNC, including jihadi Keith Ellison, openly want the undermining of liberty and the Constitutional Republic. If you keep that in mind, everything they do will make sense.